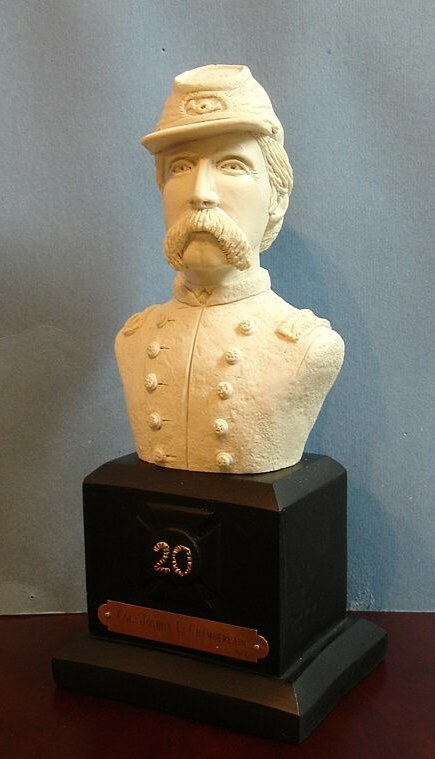 This sculpture of Joshua Lawrence Chamberlain depicts him as he was in 1863 at Gettysburg, a Colonel. Joshua Lawrence Chamberlain was a professor at Bowdoin College in Maine at the outbreak of the Civil War, and enlisted in the 20th Maine Volunteer Infantry where he was commissioned Lieutenant Colonel. Although he was inexperienced as a military man, he learned quickly and became a solid infantry commander. July 1863 found the 20th at the Battle of Gettysburg - on the extreme left of the Union line, on a rocky hill named Little Round Top. The regiment staved off several assaults by Confederate troops determined to drive them off the hill and "roll up" the Yankee line. Faced with another assault, and virtually out of ammunition, Chamberlain ordered his men to fix bayonets. As the Southerners began what was to be their final charge Chamberlain ordered the 20th to charge down the hill in a gate-like fashion and swept the Rebels from that part of the field. 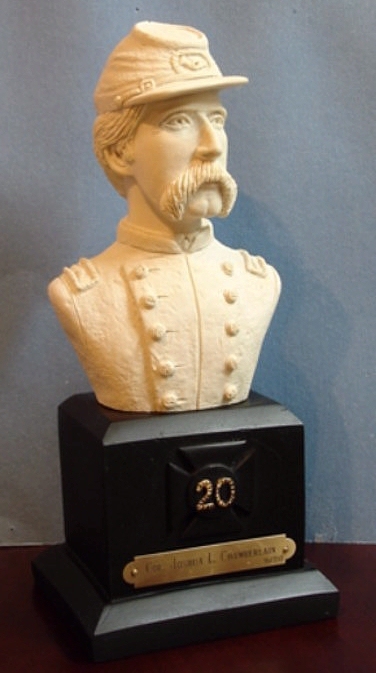 The courage of the 20th Maine and the leadership of Colonel Chamberlain prevented the destruction of the Union line and played a pivotal role in the success of the Federal Army in this great battle. Joshua Lawrence Chamberlan served with distinction throughout the Civil War, and was so severely wounded at Petersburg that his obituary appeared in the newspaper. He not only survived his terrible wounds, but returned to active service with his regiment and was promoted to General. 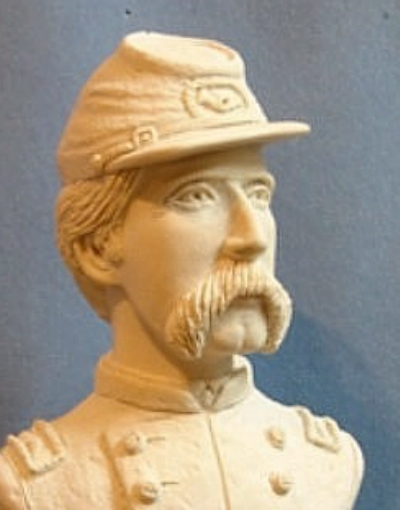 He continued on to the end of the War despite constant pain from his wound, and played an important role at the surrender of General Robert E. Lee's army at Appomattox. Following the War, Chamberlain returned to teaching at Bowdoin College where he eventually taught every subject except mathematics. He later became President of the college. Chamberlain was also active in politics, and became Governor of Maine in 1867. He continued his political work , as well as his involvement with Bowdoin College, until his death in 1914 from complications to the wound he had received nearly 50 years before. 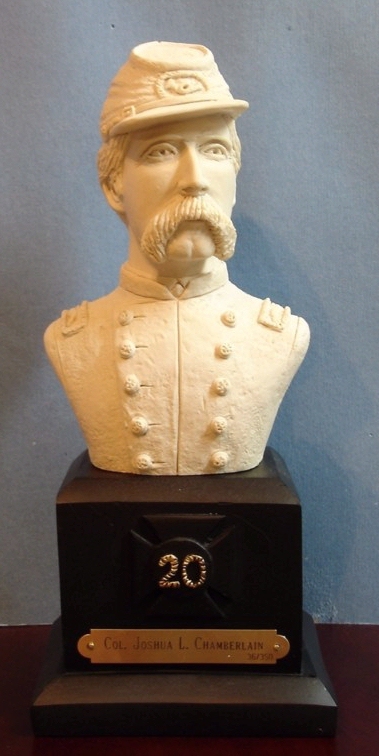 The bust was cast in three mediums, cold cast Bronze, pecanwood and also in White Marble. 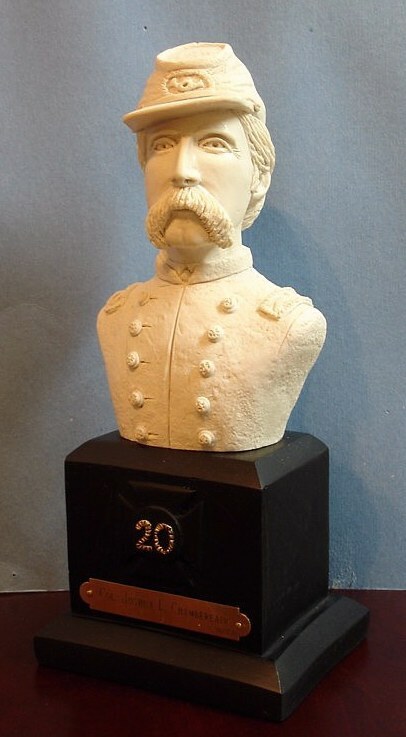 The Base is available in either Granite or Black Marble and bears a brass nameplate and the Corps insignia of the 20th Maine. Dimensions of the piece are 10" high X 4 1/2 " wide X 3 1/2" deep. White Marble on Gray Granite - $140.00. Pecanwood on Gray Granite - $140.00. Edition in Cold Cast Bronze on Black Marble - $170.